Sometimes fixing dinner is the pits. Not only do you have to come up with a main dish that everyone likes, but you also have to make two or three sides to go with it. Luckily, our family has some favorite one-bowl meals that make dinner time a little bit easier. By my definition, one-bowl dinners contain some sort of grain, protein, veggie, and possibly other toppings. Everyone gets to build their own bowl according to how they like it. Here are a few of our family’s favorite one-bowl meals. What are some of yours? Share your favorites in the comments below! Hawaiian Haystacks – This is the first one that comes to mind when I think of one-bowl dinners. We start with white rice, add some shredded chicken and then cover it all with a creamy white sauce. For toppings, I always have pineapple, mandarin oranges, shredded coconut, green onions, and crunchy chow mein noodles. Sometimes we also have tomatoes, peppers, olives, sliced almonds, and cheese. I say the more toppings the merrier! 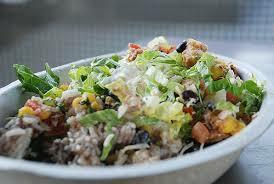 Burrito Bowls – I prefer brown rice in my burrito bowl. We then include some kind of taco-seasoned meat. Or sometimes I will go all out and make sweet pork barbacoa. We always have beans, usually black, and then come the veggies. Lettuce, tomatoes, avocado, green onion, and black olives are all winners. I also enjoy topping mine with some taco sauce or salsa and a little sour cream. Chicken Alfredo Bowls – This is a pasta bowl. I often do Farfalle pasta because my kids call it “butterfly pasta.” I grill some chicken, cut it into strips, and put it on top of the pasta. I usually steam some broccoli or cauliflower to go with it and then we smother it all in Alfredo sauce. I also enjoy sprinkling some fresh parmesan cheese and a little bit of lemon juice on top. BBQ Bowls – I guess technically, our BBQ bowls don’t have a grain because we start with mashed potatoes. Then we add some kind of barbecued meat, usually pulled pork or chicken, which I make in the crockpot. Then we top the barbecued meat with caramelized onions and green peppers. Korean Beef Bowls – This is one I discovered about a year ago and I absolutely love it. You start with Asian white rice like Calrose or Jasmine. 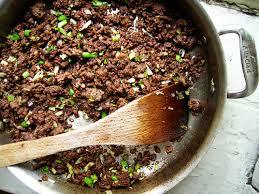 You make the Korean Beef mixture according to the recipe below and put it on top of the rice. Add steamed broccoli, green onions, and sesame seeds. It is so tasty…try it! Over medium heat, brown the ground beef with the sesame oil and garlic. Drain the fat. Add the soy sauce, brown sugar, ginger, and red pepper flakes. Bring to a boil and quickly reduce heat to a simmer. Simmer for 5-10 minutes to blend the flavors. Serve over rice and top with steamed broccoli, green onions, and sesame seeds.